8 year/s ago 2375 Visit WebsiteIndustrialBroken link? Thinking Beyond Quality Testing Solutions? 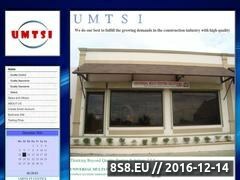 UNIVERSAL MULTI-TESTING SOLUTIONS INCORPORATED (UMTSI) is a private firm, wherein the objectives is to conduct accurate materials testing both for private and government projects at a reasonable price. All testing procedures were based on the method of Department of Public Works and Highways Standard Specification which is the governing specification here in the Philippines. The laboratory equipments/apparatus were calibrated by the duly accredited DPWH calibration company because, it is our mission to serve our client with the efficient and accurate test results for their projects. UMTSI provides testing, monitoring and quality control for construction materials such as steel products, concrete, aggregates, soil as base coarse and embankments as part of quality assurance for any project. The company staff is resourcefully equipped by qualified engineers and technicians using high-in facilities and up-to-date laboratory equipments. The laboratory is duly accredited by the Bureau of Research and Standards or BRS-DPWH for material testing on government projects. Recommending Davao City said 7 year/s ago: All universal multi-testing solutions from Davao City are great! Software Product testing We offer affordable software and website usability testing services. Our software testing lab is equipped with latest software and web usability test suits and technology. Your guide to the Chinese Drywall Problem Chinese Drywall Advisors provide solutions to Chinese Drywall problems through quality testing and inspection.